For my class homework, we had to memorise or read a poem to the class! I could not decide which poem to say --Trees (by Joyce Kilmer) or Dreams (by Langston Hughes), --but in the end I chose Trees. Three children from each class got chosen to go to the finals. From my class, I was one of the three that were chosen. We had to say the exact same poem as what we had recited in class before ( for me I had to say Trees) and one person would win from each class and I WON from my class! I did really like the poems that my other two classmates performed. I thought they did great, too. I felt really nervous while waiting for my turn to perform. I had a thousand million butterflies in my stomach! I really wanted to win. When I found out I'd won, I was really happy and excited to find out what my prize was. 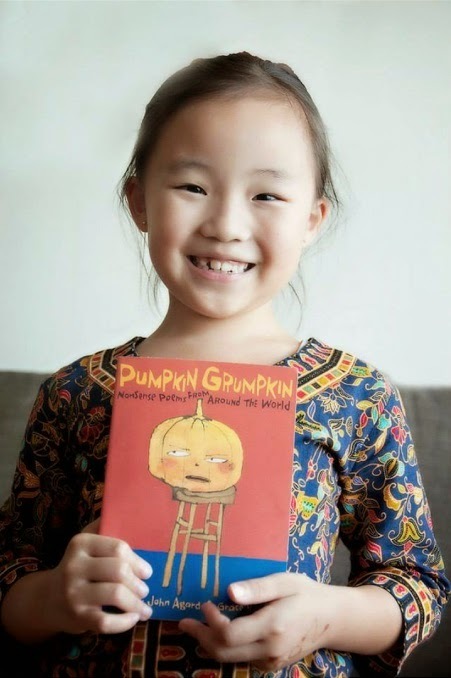 I got a book called Pumpkin Grumkin as my prize. In this post I am going to share a poem from that book with you (see below)! Here is me holding my prize! They do not see so well. They've lost their sence of smell. My nose has lost its power of speech. My tongue, its sense of touch. My hands can't hear you so much. I really like funny poems like Ken Nesbitt's poems, because they're silly and they make me laugh. What kind of poems do you like?